To deliver on its aspirations for the future, Saudi Aramco is developing increasingly sophisticated upstream operations, expanding its downstream business, and pursuing ever more ambitious technological innovations. This transformation requires an immense amount of creative and intellectual energy – all of which is generated by the more than 61,000 members of the Saudi Aramco family who know that the work they do today will have a positive impact on someone at home or abroad tomorrow. Turning great aspirations into reality requires great capabilities. In 2014, Saudi Aramco funnelled significant energy into making sure that its people have the opportunities and support they need to acquire essential new skills and abilities. From educational and developmental programmes for its growing ranks of young employees and specialised technical training programmes for its seasoned professionals, to experiential courses for its current and future leaders, Saudi Aramco builds the capacity of its employees to be ready to take on the challenges ahead. And it is not just its own workforce: Through its expanded business activities and initiatives to advance the kingdom’s economy, Saudi Aramco enables thousands of new employment opportunities in the domestic labour market. Many of these jobs require specialised skills, says Saudi Aramco in its 2014 Annual Review. To meet this need, Saudi Aramco partners with local training organisations to create training institutes to prepare the kingdom’s young workforce to take advantage of the upcoming opportunities. The key to successfully competing in today’s dynamic global business environment is the ability to recruit top talent. Today’s workers are not just looking for jobs – they are searching for purpose and the opportunity to make a positive difference through their work. In 2014, the company’s workforce grew to an all-time high of 61,907. Its new employees are drawn by the challenging professional opportunities Saudi Aramco offers and by the opportunity to work on meaningful projects that drive its actions as a catalyst for a sustainable future. Saudi Aramco further energises its workforce by fostering a culture that values ideas and merit-based performance. These elements, combined with its high ethical standards, have earned it the trust of its employees and the respect of its peers and competitors, making it a highly sought-after career destination. With more employees comes the responsibility to provide for their physical and social welfare and that of their families. In 2014, Saudi Aramco worked towards creating communities for its employees that are healthier, safer, and more sustainable. At Saudi Aramco, employees are inspired by where it is going and the company works hard to ensure its people have the skills to take it there. 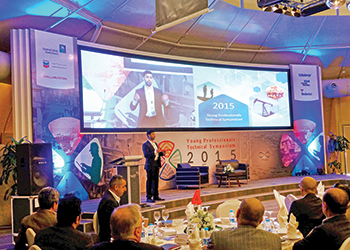 Saudi Aramco’s workforce of the future is trending younger. In 2009, nearly 70 per cent of its employees were above the age of 35. Today, almost half of its employees are 35 or younger. Saudi Aramco hired 1,713 Saudis in 2014, a 3 per cent increase over 2013 levels – and a figure more than three times greater than the 2010 hiring level. And while Saudis make up almost 84 per cent of its workforce, its small but valuable expatriate labour force is becoming younger and more diverse as well. To meet the growing human resource needs of its new businesses and ventures, Saudi Aramco attended 11 major events and conducted 117 workshops around the world. In 2014, the number of nationalities represented in its 35-and-under expatriate employees rose from 37 to 61. Saudi Aramco supports continuous learning and self-development by running the world’s largest corporate training programme. It also matches its younger employees with more experienced mentors to advance their acquisition of technical proficiency. In support of its performance- and merit-based work culture, in 2014 Saudi Aramco instituted an incentive programme designed to reward employees for their individual contributions to helping the company achieve its business targets. The Jazan Refinery and Terminal project is one example of how Saudi Aramco is amplifying the benefits of its business activities for the benefit of local communities. Saudi Aramco formed a nonprofit organisation, the Jazan Contractors’ Consortium for Training and Employment – 'Maharat,' – with its local and international engineering, procurement, and construction contractors to train qualified Jazan-area high school, technical, and industrial college graduates in specialised construction trades. These young people are then employed by the consortium to support the construction of the Jazan facilities, giving them an opportunity to start a career and make a tangible contribution to the economic development of their communities. The Jazan Contractors’ Consortium is a sustainable model that Saudi Aramco intends to replicate and institutionalise for all future mega-projects. As Saudi Aramco executes its strategy to become a top-tier global chemicals company, it is building the world-class workforce essential to successfully accomplish this goal. Saudi Aramco launched an aggressive recruitment campaign and has hired a core group of qualified professionals, including chemical engineers, marketers, supply chain experts, industrial engineers, and financial experts. Saudi Aramco also hired over 120 male and female Saudi graduates from universities around the world for positions in its Chemicals organisation. To enable these young Saudis to effectively take on the mantle of leadership in the years to come, Saudi Aramco created programmes to further develop their capabilities through assignments and internships inside and outside the company. Skilled manpower is essential to the success of Sadara, its joint venture integrated chemicals complex with Dow. To accelerate the readiness of hundreds of Sadara manufacturing employees, Saudi Aramco established on-the-job training programmes for them to acquire capabilities alongside Dow’s experienced workforce. At the programme’s peak, around 50 trainees were embedded in Dow facilities in the Netherlands while similar numbers were working at other Dow sites in Germany, Portugal and Thailand. At year-end 2014, over 200 trainees had successfully completed their assignments and returned to Saudi Arabia. During their international training assignments, the Sadara trainees also participated in citizenship projects in their local communities. By optimising its maintenance training curriculum, Saudi Aramco accelerated the training time of the participants in its Apprenticeship Programme for Non-Employees and improved success rates. The enhanced maintenance training programmes now utilise a performance-based smart curriculum and learner-centred instructions, significantly reducing time to achieve competency. In all, more than 600 apprentices in the various maintenance disciplines were trained in 2014 using the new curriculum, resulting in a 10 per cent to 20 per cent reduction in contact hours. Redesigning its maintenance curriculum assures strategic alignment between job task competency for its apprentice graduates and business line requirements for entry-level skills. In a first for the region, Saudi Aramco added a fully immersive and state-of-the-art maritime vessel navigation simulator to bolster its marine training. The simulator uses an exact replica of the bridge of a Saudi Aramco vessel and has a 360-degree virtual display. Trainees are immersed in precise simulations of operational scenarios, including terminal berthing and approaching jack-up barges, rigs, and gasoil separation plants. Weather conditions and environmental factors are faithfully recreated, enabling the development of customised training programmes that help enhance safety and efficiency. Housed in its Marine Academy in Ras Tanura, the simulator provides realistic, real-time simulations that help prepare its trainee captains and engineers for real-life situations before they ever set to sea. It is also used to provide procedural and emergency training for its offshore and shore-based employees. Improving the company’s capabilities dictates that Saudi Aramco must raise the capabilities of its professionals as well. In 2014, Saudi Aramco instituted innovative programmes to prepare its professionals to contribute to its business objectives at a higher level. Saudi Aramco also entered strategic partnerships with domestic and international businesses, agencies, and universities to extend the benefits of its training programmes to Saudi men and women who are not employees. All newly hired Saudi university graduates spend their first three years with the company in its Professional Development Programme. In 2010, Saudi Aramco piloted the Saudi Aramco Professional Development Academy, a new on-boarding programme designed to build individual and team-based competencies. The six-week interactive programme focuses on health and safety, leadership, communications, and community service and features workshops, guest speakers, site visits, and collaborative experiences. From the first pilot group of 29 participants, the programme has evolved to become a permanent offering in the Professional Development Programme. By the end of 2014, more than 1,600 young Saudi professionals, including 180 women, had participated in 22 sessions of the academy. The company’s Youth Leadership Advisory Board, or YLAB, is a group of 16 young employees who serve 18-month terms and conduct studies on topics of significant importance both to the company and to young people. The group provides advice, ideas, and insights to senior management and engages other young employees in the changes taking place throughout the corporation. Saudi Aramco is now on its third YLAB cycle and the programme has influenced other young employees to create their own self-directed 'youth-only' groups to tackle issues of importance to them. Saudi Aramco boosted the marketable skills of over 500 Saudi women by partnering with local entities to create the Mahara programme. The three-year programme will train a total of 750 women, with each participant receiving 724 hours of training. The curriculum focuses mainly on highly sought-after information technology, English language, and business communication skills. The goal of the programme is to increase employment opportunities for Saudi women. Of the class of 2012–2014 graduates, approximately 250 were hired by various local companies, including 32 who found employment with Saudi Aramco. After noticing a mismatch between the skills possessed by female information technology graduates and those needed in the marketplace, Saudi Aramco saw an opportunity to bridge that gap. It collaborated with 14 universities, conducted seminars for over 1,175 attendees, and created specialised training plans for Saudi female graduates focusing on information security, engineering design, and network operations to enhance their employability. As a company that values and prioritises continuous learning and self-development, Saudi Aramco regularly partners with leading educational institutions to bring the latest knowledge and technologies to the kingdom. In 2014, Saudi Aramco collaborated with three prestigious international universities to offer part-time targeted and specialised custom hosted master’s degree programmes for its professionals, bringing its total number of hosted university degree programmes to 11. The Graduate Institute Geneva offered a master’s degree programme in advanced investment analysis while the Georgia Institute of Technology from the US was selected as its strategic partner to deliver a professional master’s degree programme in information security. Through this programme, its employees are developing the skills that will help keep its cyber infrastructure – and the kingdom’s – secure while acquiring effective mitigation and containment strategies in this critical area. Thirty-five students are participating in this hosted programme. The company’s corporate hosted university programme also includes a Master of Science programme in human resources management. The programme is intended to increase competency in fields such as recruiting, selection, retention, organisational behaviour, staffing, compensation, research methods, and information systems, among many others. Texas A&M University from the US was selected to deliver this in-kingdom programme. At year-end, 27 employees from across the company were participating. Saudi Aramco also collaborates with world-class universities to provide advanced skill-building programmes. Beginning in 2012, Saudi Aramco launched a programme with Michigan State University’s School of Communication to provide advanced public relations and communications training in Saudi Arabia. To date, nearly 200 of its professional staff have completed the 22-week programme. Saudi Aramco continued its partnership with MIT to nurture the research skills of Saudi female university faculty members majoring in science or engineering. 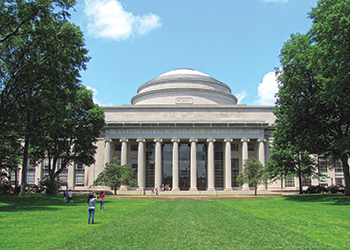 The company’s prestigious Ibn Khaldun Fellowship for Saudi Women is a merit-based, one-year research programme at the MIT campus. It gives Saudi female doctorate degree holders the opportunity to conduct advanced research under the supervision of an MIT senior faculty member. In 2014, a total of 10 fellows from domestic universities were participating in the programme. This programme is just one example of its strategic investments in not just the employees of Saudi Aramco, but in the people of Saudi Arabia. Saudi Aramco enables opportunities for ambitious talent to do the best work of their lives, part of its greater goal of building a knowledge economy in the kingdom to help ensure the prosperity of future Saudi generations. Not all of its human resource development programmes are driven by its training organisation: Some of its most innovative approaches come from within – Qudwa is a case in point. Qudwa, which means 'role model' in Arabic, is a volunteer organisation dedicated to encouraging dialog through networking, knowledge sharing, and skill building, with special consideration to gender differences in the workplace. The group’s events, which include guest speakers and Q&A sessions, highlight the need for self-awareness and self-development. A company-wide mentorship programme has been particularly successful in helping its newer Saudi female employees achieve more. Membership in Qudwa is roughly 2,800 and more than 4,300 employees have been reached through the group’s activities. In 2014, Saudi Aramco expanded the team responsible for coordinating the activities of the company entities involved in promoting gender diversity. This resulted in a new organisation called the Women Development Programme (WDP). The programme supports the development of its female employees and also delivers diversity training for teams across Saudi Aramco. In addition, the WDP arranges outreach programmes at female universities and works with local businesses and government agencies to prepare female students for successful careers, bridging the gap between education and the skills needed in the domestic labour market. In 2014, the WDP conducted over 100 workshops, seminars, and forums, reaching more than 2,500 female employees, students, and other professionals. The workshops were offered on topics such as transitioning to the workforce, conversational styles, personal branding, and character building. The programme encourages, empowers, and increases the competencies of women in the workforce within Saudi Aramco and in local communities, part of its long-term vision to create opportunities and inspire ambitious young Saudis. At Saudi Aramco, it is anything but business as usual. Every day brings new opportunities to capture and new challenges to overcome. Successfully navigating the company’s transformation into an integrated energy and chemicals enterprise requires leaders who inspire, empower, and motivate their teams. It requires leaders who can translate its diversifying business strategy into meaningful and actionable outcomes. It requires pioneering leaders who can find unique solutions that produce exceptional results while upholding its legacy of excellence. Leadership development is one of the most critical areas for business success. In 2014, Saudi Aramco employed a multitude of training regimes to ensure its leaders possess the transformational skills required to achieve its 2020 Strategic Intent. The company’s transformation from an oil production powerhouse to a globally integrated energy and chemicals enterprise requires intensive skill building inside and outside of Saudi Arabia. In 2014, more than 100 Saudi Aramco professionals worked as interns at companies in North America, engaged on assignments in manufacturing, oil and gas, and electricity facilities; in offices conducting financial and accounting activities; in security industries; in medical facilities; and in an array of other disciplines. In addition, many of its leaders are assigned multi-year rotational assignments with its offices in the US, Europe, and Asia, building their global acumen. Critical advances in technology and innovation are essential to achieving the level of sustainability Saudi Aramco is pursuing in its operations. To ensure that the company’s R&D activities support its goals and achieve the necessary impact, Saudi Aramco created a comprehensive development programme for its division heads, or front-line supervisors, in its R&D Centre in Dhahran. Through individual coaching sessions and team interventions, its R&D Centre leaders found solutions to their particular challenges, improved their leadership skills, and achieved greater alignment with its strategic objectives. Another leadership development programme targeting this level of its leadership is its Human Resources Partnership Programme for Division Heads. Now in its second year, programme participants learn about the important role human resources plays in driving business results and are exposed to a variety of tools, conceptual models, best practices, and case studies. The division heads benefit from interaction with subject matter experts representing a variety of functions. The company’s professionals also benefit by gaining a greater understanding of the most pressing human resource issues affecting line leadership. By working together, division heads and human resources personnel find ways to better address these challenges. To date, over 800 of its division heads have participated in the programme. Saudi Aramco also piloted the Leadership Series for Managers, tailored specifically to prepare division heads for their transition to the role of manager. Designed with the input of its executives and facilitated by experts in the field of leadership development, the programme uses experiential learning, project work, and one-to-one coaching to embed new skills and behaviours that can be immediately applied in their current role as well as more complex managerial situations. The Saudi Aramco Leadership Forum is a unique venue for its high-potential supervisors, division heads, and senior professionals to participate in facilitated discussions with senior executives. The forum encourages open dialogue on a variety of topics related to leadership, including staff development, strategic thinking, and ethics. While high-potential professionals benefit immensely from these candid discussions, its senior management also receives valuable insights into the current challenges facing its up-and-coming leaders. Since 1999, the forum has been instrumental in preparing 1,360 of its high-potential leaders for greater responsibilities. With more than 60 per cent of its crude oil and nearly half of its refined products exported to the countries of the Far East – and with its growing chemicals business in this region – its Asia Business & Culture Programme fulfils a strategic need in its leadership development regime. This programme builds cross-cultural and geopolitical understanding and helps prepare its leaders to be effective communicators, managers, and negotiators in these vital business environments. The central goal is to produce highly motivated leaders who are familiar with Asian cultures and business practices and who are well-positioned to make significant contributions to its joint and equity ventures and new business developments in Japan, South Korea, and China. The programme, held biennially, has included 85 of the company’s top leaders since its inception in 2001. One way Saudi Aramco energises the people and ideas that make it a catalyst of innovation and opportunity is by creating communities its employees are proud to call home. Healthy, vibrant communities contribute to the well-being of its employees. By developing sustainable communities for its people, Saudi Aramco also leads by example to stimulate energy-efficient residential development in Saudi Arabia. In 2014, Saudi Aramco broke ground on the most significant expansion of its Dhahran community in three decades and also moved forward with its plans to build an entirely new, sustainable model community near Dhahran. Saudi Aramco also continued an important legacy programme that helps make it possible for Saudi employees to fulfil the dream of owning their own home. A unique benefit Saudi Aramco has long provided to its Saudi employees is assistance in securing loans to build a home in Saudi Aramco-prepared communities. Several land development and infrastructure projects are ongoing in various locations, including Dammam, Jubail and Al-Hasa. Other infrastructure projects in Abqaiq, Yanbu, Dammam, and Dhahran are ready for awarding. In 2014, 1,037 new home loans were granted. Over the life of the programme, more than 63,000 new homes have been financed through its Home Ownership Programme, enabling generations of employees to improve their quality of life and contributing to the growth of dynamic communities. The company’s Communities of Excellence initiative aims to implement best-in-class social, environmental, and economic practices in the communities hosting Saudi Aramco’s Home Ownership programmes. The first development aligned with this initiative is the South Dhahran project. 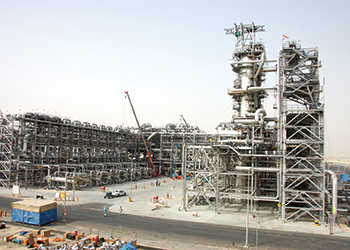 In May 2014, Saudi Aramco completed the commercial master plan and financial evaluation for the project. South Dhahran is a planned, mixed-use community that includes homes, parks, schools, mosques, recreation centres, a health clinic, and commercial districts. Located close to Dhahran, the South Dhahran home ownership community is intended to enhance the work-life balance of its employees. Built in phases, it will contain approximately 8,500 ready-built villas and apartments and will also feature a full range of commercial services. This project is unique for its size and its comprehensive and cohesive modern features and services. Once proven in South Dhahran, this business model can be a kingdom-wide benchmark for future housing initiatives. At Saudi Aramco, health and safety are two sides of the same coin; each promotes the other and Saudi Aramco actively promotes them both for the long-term benefits of the company and the kingdom. Safety is one of its core values. Every year for over 80 years, Saudi Aramco has worked to instill a culture of health and safety within its company and in its communities. This year was no different. Saudi Aramco launched several new initiatives in 2014 to strengthen its safety culture and improve the health of its employees and their families. Saudi Aramco is working to make a positive difference in the world. But taking care of the health and safety of its people is the most important work of all. In 2014, Saudi Aramco inaugurated a first-of-its-kind health care joint venture in Dhahran with its partner, Johns Hopkins Medicine. The formation of this new company, Johns Hopkins Aramco Healthcare (JHAH), represents a significant milestone in the transformation of medicine and health care in the kingdom. 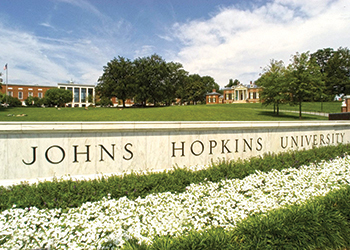 Under the terms of the initial 10-year agreement, Saudi Aramco and Johns Hopkins Medicine will each hold an indirect ownership stake in the new Saudi-registered company. JHAH brings together its long-established health care delivery system and the world-renowned clinical, education, and research expertise of Johns Hopkins Medicine. JHAH will fuel clinical innovation, serve as a model of health care in the kingdom, and contribute to the development of the country’s health care in alignment with its commitment to enabling growth, opportunities, and diversification within the kingdom’s economy. Safety is one of its core values and Saudi Aramco works to embed a safety-first mindset on and off the job in its employees and their families – and in the wider community through its safety outreach programmes and campaigns. 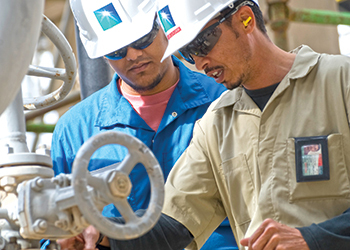 In 2014, Saudi Aramco conducted a number of major safety initiatives to strengthen its culture of safety and to enhance safe practices across its operations. Its Safety Leadership Workshops empower management with the skills to be visible safety leaders. Since the programme was first introduced in 2005, a total of 93 workshops have been offered to more than 1,100 managers and division heads. Its Loss Prevention organisation conducted 18 major compliance reviews and also participated in two collaborative technical exchange meetings with joint venture partners Dow and Sinopec. The meetings provided a platform to communicate and share best practices for mitigating health, safety, and environmental concerns. These safety training programmes and practices are a significant factor in its success in improving its overall safety performance. In 2014, Saudi Aramco recorded a lost-time injury rate of 0.05 injuries per 200,000 work hours, a 44 per cent reduction compared to 2013. Its safety performance was recognised by the US-based Gas Processors Association. Several of its gas plants achieved significant safety milestones, including its Juaymah NGL facility, which reached 6.5 million work hours without a lost-time injury, and its Khursaniyah and Berri plants, each of which achieved 3.5 million work hours without a lost-time injury. Saudi Aramco also recognises and rewards exceptional safety records among its employees, helping instill a culture of safety across the company. In 2014, Saudi Aramco honoured 397 employees who completed 35 years of service without an incident – the largest number of employees who have ever reached this safety milestone in a single year. Off-the-job disabling injuries – mainly due to traffic accidents – remain a cause of concern for it and for the kingdom. In 2014, Saudi Aramco experienced an off-the-job disabling injury rate of 0.42 per 200,000 hours of exposure, a 29 per cent decrease compared to 2013. In response to the growing number of incidents involving traffic safety, Saudi Aramco increased its efforts to make its roads safer by establishing a traffic safety taskforce comprised of corporate and manager-level personnel. The taskforce is developing a set of initiatives in five focus areas including cultural factors, engineering, and education. Traffic safety is a 24/7 concern for it: Every day, thousands of its employees drive company vehicles for work purposes – and often in remote locations. In 2014, Saudi Aramco began a campaign to install an automatic vehicle locator device in its fleet of work vehicles and to educate employees on how the device will save lives through encouraging safe driving habits. The system uses real time GPS capabilities and other sensors to monitor vehicle location, tire health, seat belt use, speed, and other safety factors. The company successfully installed the system on 47 per cent of its company vehicles, including security vehicles. It is on track to complete the installation programme by the end of 2015 and is coordinating with its IT organisation for full automation and other system enhancements. During the course of the year, Saudi Aramco held several safety-related campaigns and workshops in company locations across the kingdom. They ranged in subject and emphasis from traffic, home, and bicycle safety to hydrogen sulphide safety and fire drills. Saudi Aramco contracts with many companies to provide services and it expects them to take safety as seriously as it does and to abide by its stringent safety standards at all times. Saudi Aramco helped improve its local contractors’ safety competency through its 2014 launch of the Contractor Safety Administrative Requirements Workshop series. The workshop is a 'train the trainer' engagement focused on giving company organisations that regularly interface with contracting companies the ability to train their personnel in Saudi Aramco safety standards and protocols. The company conducted roughly 75 workshops in 2014, amplifying its safety training and helping to raise safety standards in the wider contracting sector. As its business activities and operations grow in scale and complexity, Saudi Aramco continues to adhere to the legal and ethical standards that are the bedrock of its reputation for integrity. Saudi Aramco goes beyond simple compliance by setting a higher standard of behaviour for its employees and its partners that it wishes to inspire in its communities. For it, corporate integrity is born out of personal integrity. The company’s standards and models of integrity flow from its fully engaged Board of Directors whose members possess a wealth of diverse experiences and future-oriented mindsets. The company’s board challenges management to adhere to the highest personal and professional standards and through the corporate audit process, set in place and monitored by the board, ensures an independent, confidential, and robust review and reporting channel. Its Business Conduct Handbook summarises the standards that enable employees to preserve and build on its proud ethical legacy by outlining the company’s policies on conflict of interest, financial integrity, intellectual property management, workplace harassment, fair practices, safety, health, and the environment. It reaffirms the guiding principles by which Saudi Aramco have achieved its success. Every employee reviews its Conflict of Interest and Business Ethics Policies on a regular basis. This ensures its ethics policies are continuously reinforced for use in real-life applications. Any ethics concerns from its employees or third parties can be clarified through its established communication and reporting channels. In addition, a General Auditor Hotline is available to provide a secure and confidential venue for people inside and outside the company to report suspected fraud, unethical conduct, or irregularities. Saudi Aramco holds employees to a high level of ethical conduct and expects the same of its suppliers. Its Supplier Code of Conduct outlines mandatory policies on environmental, health and safety issues, fair trade practices, ethical sourcing, conflicts of interest, bribery, kickbacks, gifts and fraud, monitoring, and compliance. Saudi Aramco’s Supplier Code of Conduct helps promote ethics across the kingdom’s private sector and assures its suppliers that the firm holds itself to those same standards.